We Are Going to a Tea ﻿﻿Party﻿﻿! 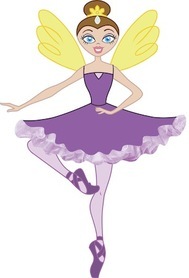 It is easy to throw a tea party for kids with tea party ideas from Prima Princessa. First you'll want to set the table. 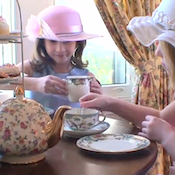 It looks fun and festive to mix things up china patterns at a tea party. Make sure to put out a pretty tea cup, saucer, spoon, plate, napkin and placemat at each seat. Don't forget some creamers and sugars as well as a few plates of lemon slices. Tip: You can use small paper cups for creamers and little cupcake inserts to hold sugar cubes. 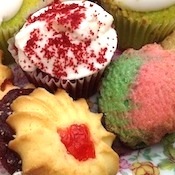 Unless you love baking, keep it simple and pick up a fun selection of fancy cookies, cupcakes and fruit at your local grocery store. You'll want at least 3 types of tea including a regular decaf black tea and a few herbals like mint and chamomile. If you use small tea pots kids can pour themselves. If you use large pots you will need to do the pouring. Make sure to let the hot water cool down so ﻿﻿it﻿﻿ will not burn any little mouths. Remember it is great fun for kids to try out all different teas and mix in the sugar, lemon and milk. Kids love outdoor tea parties! 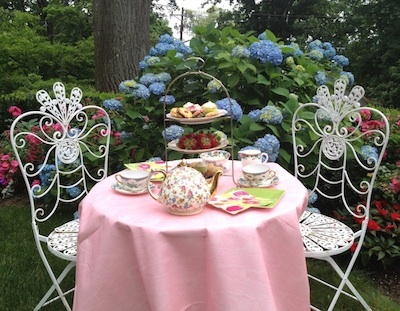 Outdoor tea parties are extra special. 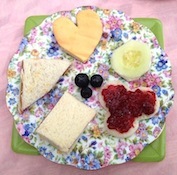 Kids will love tea party picnics. Set up a table outside or just a sturdy paper table cloth on the ground will work. There are all sorts of beautiful paper plates available which can often be found at your local grocery store.